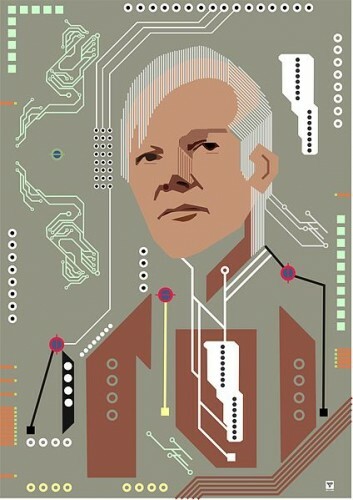 Assange’s position is: the government (that is, us, we the people) should have open access to every email, every phone call, every conversation, and be able physically surveil every activity of everyone. You think I’m crazy. Unless you work at a small company called Google, where every single thing I have just mentioned is official policy and ongoing practice and occasionally even mentioned on Google company blogs because the employees are hypmotized into thinking it’s great. well, there are probably not cameras in the bathrooms–though i would not rule out microphones. So: how does Assange propose to draw a line between the data that “should” and “should not” be “open”? answer: he doesn’t even try. and who does he propose should draw that line? just him. in what sense is it part of “democracy” to have one lunatic do that whose own hacker/leaker friends disagree with him? add: are pseudo-utility web services like Google, Twitter, Amazon API (bells should be ringing) and Facebook part of the government whose data should be radically exposed? There will become stronger and stronger arguments that they are. how many champions of Assange also believe that their Facebook data should be private? these will soon become mutually exclusive propositions if Assange gets enough followers. or if they are not already. I feel really bad about this, but I’ve decided an academic career is less important than being able to tell the truth once in a while. the two are coming to seem less and less compatible. or is it my imagination that many people who will openly explain how loathsome Howard Roark is, will champion the exact same nihilistic, destructive, self-centered and self-aggrandizing “philosophy” that the Roark-like Assange embodies. This entry was posted in "hacking", cyberlibertarianism, google, information doesn't want to be free, privacy, revolution, rhetoric of computation, we are building big brother and tagged "climategate", "open", "twitter revolution", 1984, africa, anti-global warming, ayn rand, clay shirky, eric schmidt, facebook, howard roark, iran, john perry barlow, julian assange, libertarianism, mark zuckerberg, open government, right-wing politics, secrecy, the fountainhead, total surveillance, wiki (software), wikileaks. Bookmark the permalink. Post a comment or leave a trackback: Trackback URL.